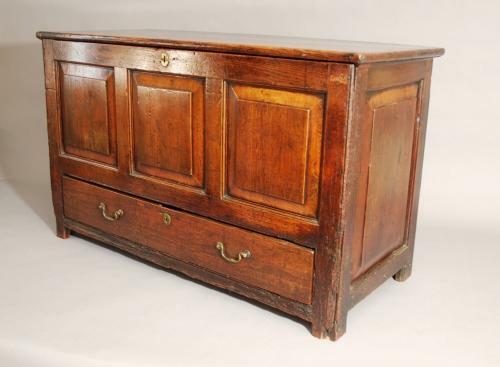 A 18thc pine mule chest of exceptional patination. The front consists of three fielded panels above one long pine drawer, standing on four square feet. The sides each have a large fielded panel and the back consists of three plain panels. The interior houses a candle box. The bottom rail & feet are very worn due to wear & tear over the years. However, this & the superb colour adds to the character of this piece.